Denise Dillon started this petition to Lee County Commissioners!! Thank you Denise!!!! This petition is for the Lee County Commissioners to release the Shell Love Bug back to its creator, Pam Rambo of Sanibel Island, FL. Pam, a local artist and Shell Expert, and her crew of volunteers spent hundreds of man hours creating and laboring over the VW Shell Love Bug for National Seashell Day in 2016. It was a verbal agreement between Pam and Lee County that stated the car would be returned into Pam’s possession after National Seashell Day. As of today that has still not occurred and Lee County is now reversing that verbal agreement. Let’s send a message to the Lee County Commissioners in support of Pam and her artistic efforts incorporating thousands of shells from her private collection in addition to shells from countless shellers and Sanibel residents. Pam, thru her website, blog, vlog, and numerous social media accounts has helped raise awareness of both shell collection appreciation and the beautiful island of Sanibel and all it has to offer. Let’s get Shell Love Bug home! Sign the petition AND LEAVE A COMMENT (either below the petition or on the top of this post under the title) so we can let them know we stand together!! Help Save Shell Love Bug! Denise Dillon started this petition to give to Lee County Commissioners! Thank You Denise!!! Lets send a message to the Lee County Commissioners in support of Pam and her artistic efforts, as well as the thousands of shells from her own collection and the collections of countless Sanibel residents that were used on the vechicle. Pam, thru her website, blog, vlog, and numerous social media accounts has helped raise awareness of both Shell collectioning/appreciation and the beautiful island of Sanibel and all it has to offer. Lets get the Shell Love Bug Home to Sanibel and to Pam where it was born and deserves to be. Glad to help in any way to bring the Shell Love Bug Home!!! Please lee county! Just do the right and loyal thing. We are a huge shelling family here , and everyone of us stands with Pam , who sacrificed so much time , energy, and a heart filled with love for her sanibel community . We are just asking to please consider that the love bug is priceless too her! The county should treasure Pam for bringing business to the area & appreciate the national recognition she has brought there with appearing on the ABC network with her Shellbug promoting National Seashell Day . I closely follow her I Love Shelling website & really missed it these cold & snowy months in PA when she stopped posting beautiful shelling spots in Sanibel! Give her her cherished & extraordinary Shellbug back to her! Pam Rambo has been a tireless steward of Sanibal Island. She has had a powerful positive impact on Sanibel Island and Lee County tourism. Her educational materials and artistic efforts have raised awareness of the special beauty of Sanibel Island and nature’s treasures. I do not understand why the Lee County Commisioners are refusing to honor their agreement. Even if the agreement was originally verbal, Pam’s voluntary contributions of time, care and artistic skills have brought awareness to thousands of sea shell collectors from around the world. The right thing to do is to let Pam continue to act as an ambassador for the wonders that exists on Sanibal Island, as well as Lee County and the rest of SW Florida by returning the Shell Love Bug and transferring the title to her. Thank you. I agree Diana. The Lee County Commissioners should be ashamed of themselves. Hang in there!! Justice will prevail. It is most obvious that you had a verbal deal as what county would otherwise let a county vehicle out of their possession for someone to perform such beautiful artwork and then not expect some sort of payment for the artwork preformed. I say it is worth at least $50,000 at this point. This artwork did not take just a few days!!! I am disgusted at what I have seen by the County, and they have to choose to keep the artwork you did for them and pay you a good price, or give you the vehicle and agree to have it promote the wonderful, amazing shelling and environmental wonders of this special part of the world. Your dedication to the community and your website is amazing . how about we take a bit of drama out by answering this question; was Pam compensated for the construction of the Shell Bug? If no, i would suggest she expected the car. If yes, it was a job and for $7500 she could buy her own car. No. I have a page that can probably answer all your questions http://shelllovebug.com/index.php/shell-love-bug-legal-dispute-news/ . Thanks for your wish of “case closed”. So Lee County does it again. Now I get an email telling me about Lee County wants to celebrate National Shell Day. Well Lee County we would like to celebrate that day but for me not until the Shell Love Bug is returned to it’s owner Pam. When that happens I will celebrate not only the National Shell Day but I will also celebrate that day because it will finally show me that Lee County officials finally displayed good character. I cannot be lured to your build a shell on the beach celebration just because you are saying I will get a free tee shirt If anyone out there does it for the free tee shirt better get the offer in writing. Just saying……. If you wish to send the gal organizing it Amanda Auer your feelings here is her email she sent me. Pam Rambo, thru her blog & promoting of Sanibel for Shell collectors, has brought 1,000’s of Visitors to Lee County who never would have known about our beautiful beaches for shelling!!! She made an agreement with Lee County, after coming up with the idea to help promote Mational Sea Shell Day, of designing & using her precious Shells tp make the Shell Love Bug, that the car would be hers, here on Sanibel, where countless others helped her glue each & every design of shells!! Lee County should be Thanking Pam, NOT reneging on their agreement! LEE COUNTY DO THE RIGHT THING !!!!!! Pam is the reason I even know about Sanibel! Have visited 3 times since learning about and reading her blog! I ❤️shell love bug she and others created! That’s exactly my story too! Our love of Sanibel Island is all because of Pam Rambo sharing hers! We’ve been there several times and it has a piece of our hearts. Pam does not deserve such disrespect and dishonesty. I hope this is quickly resolved! Same here. We have been to Sanibel four times in two years – from the West Coast even – from Pam’s marketing/advertising efforts. Seems to me that Lee County has benefited greatly financially from the influx of people and tax dollars that have come to the area from the information and love of shelling that Pam has personally shared with the world, with all of us. We were last in Sanibel in November 2018 and had the great experience to go shelling with Pam. We had a fantasic time and Pam was a fantastic ambassador for the area, the local tourism industry and shelling. I would hope Lee County would come to their senses and do the right thing. I come to Sanibel every year for 2-3 months. I follow the I love shelling web page all year! This is just riduculous to he treated thos way after all the hard work and attention it has brought. The good will and positive marketing that this gracious lady brings to Lee County is invaluable. Thousands of fans follow her blog. Lee County, please do the right thing and make arrangements to get the Shell Love Bug back to her. I completely agree! If not for Pam, I would have never known Sanibel Island existed. My husband and I are leaving this Saturday for our first trip to the island. I’ve followed her blog faithfully since the beginning and it breaks my heart to know that she’s hurting after all of the joy she’s shared with us through the years. What a despicable thing to do to someone who has been such an inspiration to so many. Shame on you Lee County. Shame on you. Such a cute representation of Sanibel and all the things we love about it. Shame on the county. Pam Ramb has promoted the love of shelling on Sanibel and Lee Co. for many years with her ILove Shelling website. It is both fun and educational. No doubt this has result in many more people coming to the area to shell and spend their $$$$$ in hotels, shops, and restaurants. With the shell donations from the community, she created the Shell Love Bug. This has helped to create more national and worldwide recognition for the area. Please bring the Shell Love Bug back to Pam and Sanibel for all to enjoy. I’ve signed your petition (not sure if it will help as I’m Canadian). To Lee County…if you read these posts, I am another person who found out about Sanibel through Pam’s wonderful website. I have been back 4 times since spending a healthy amount of money 🙂 I’m confident the tourist value from Pam’s numerous years of sharing the beautiful Sanibel Island far exceeds the value of that car. What people would like to see is all the work that went into this venture and not having it sit under some red tape. Good luck Pam with this issue. I hope upon my next return it will be more favorable news! So much hard work and so many personal donations made Shell Love Bug. When we visit Sanibel, we look forward to seeing it around town. Please return it to Pam. Come on Commisioners use your common sense. Would all those volunteers donate all that time and materials if they didn’t believe that the “Love Bug” would be returned to Pam and Sanibel where all the avid shelters could enjoy seeing her. The only reason we came to Sanibel/Captiva and continue to come every year was because of Pam’s blog making us aware of the shelling community down there. She contributes to tourism in Lee County and she should be thanked – not fought. Do the right thing Lee County. This will go national eventually and the country will end up forming an opinion….not just the county. Will that be good for your area? As a Lee County resident and tax payer, I fully support bringing the Shell Love Bug home to Sanibel Island. The value of the shells, labor and artistic design far exceed the monetary value of the car alone. 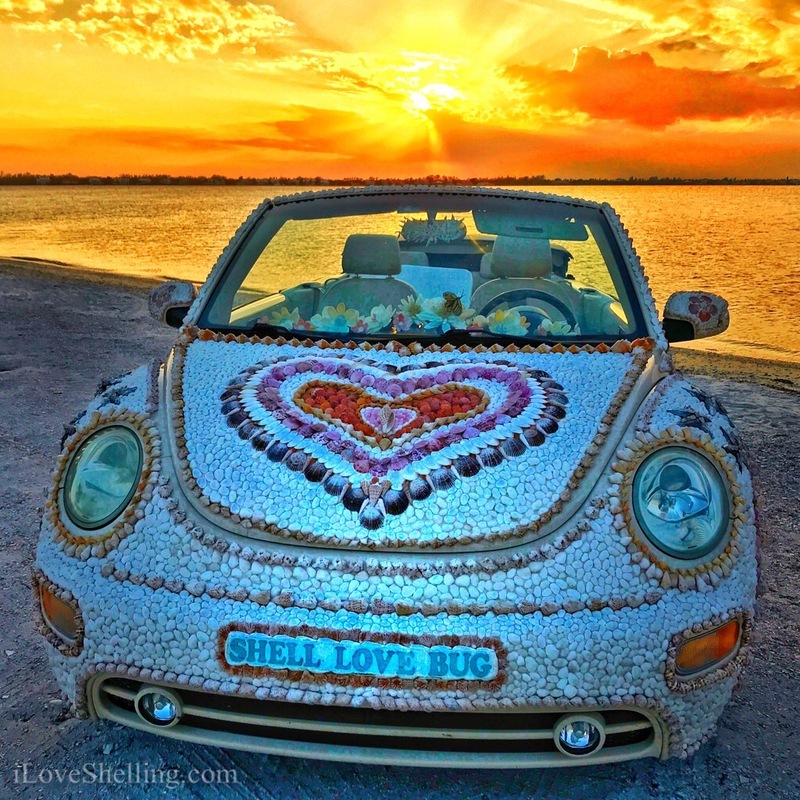 The Shell Love Bug was designed to represent Sanibel for the 1st National Shell Day. It should stay with Sanibel. Pam Rambo is the reason my family, friends and I even know about Sanibel and have traveled there for many wonderful vacations. She has done wonders to promote Sanibel and Lee County and they have benefitted greatly from her persona. It is despicable for them to think they can now claim ownership of an artists precious work and personal collection. They are creating bad PR for the county, when all Pam has done is create thousands of dollars of revenue for Lee County by sharing her love of shelling with the world. Shame on Lee County. The bug wants to go home. More than its heart is from Sanibel. It needs Pam!! Send the shell bug home!!! It’s shameful and dishonest of the Commissioners of Lee County to break their agreement with Pam. It’s also illegal. Sanibel is a beautiful island and would hate to see it’s reputation as a beautiful island tarnished by greedy, disrespectful, and dishonest Commissioners. Do the right thing and you will feel so much better about yourself. Bring the Shell Love Bug home to Sanibel and Pam where it belongs!! Following Pam and her website is the reason I keep coming to Sanibel. I am jealous of seeing all the gorgeous shells and trek down from Seminole frequently to find my own. 🙂 Before living in FL I lived in MN and would often go to Sanibel on vacation. Please do the right thing and honor your agreement. Those shells are hers and gifts from others to the community! Pam is responsible for a lot of my hard earned dollars being spent on beautiful Sanibel! Pam Rambo has brought more tourist to the Lee County beaches than the commissioners could have dreamed for, with her blog, shelling cruise trips, local news stories, and National news interviews! Pam can be spotted on the beach talking to and informing people about shells. She is the best Ambassador for Lee County Beaches that you could hope for and she does it all on her own time and dime. Pam and her husband have both been ambassadors for not only Sanibel but SW Florida. Their positive attitudes and knowledge of the area drew us and others back year after year to the point of my husband and I wanting to relocate to the Lee County area. No true sheller puts family shells or favorite shells from their collection on anything that they think will be lost to them forever. We believe Pam was told the car would be returned to her. If she has possession of the car, she will use it to be the ambassador for SW Florida as she has always been. This “shell-luvbug” belongs with its Momma! Pam has educated thousands of people from all over the world to the beauty and fascination of seashells. How could you possibly think she would give this “shell-labor of love” to you permanently ? Sounds like your corporate attorney tried to pull a fast one on a dedicated Florida resident. Nasty politics! We visited Sanibel for the first time because of Pam Rambo and her love and promotion of shelling. If it hadn’t been for her blog and passion for Sanibel, I don’t know that us west-coasters would have gone all that way. Pam is a marketing treasure for Sanibel and surrounding areas. Treat her with the respect and appreciation she deserves! Threaten to take all your shells off “their” car if it is not returned immediately!!! I discovered Sanibel because of Pam Rambo’s website. I have travelled there 3 times now, spending lots of money in Lee County. For you to ignore what Pam brings to Lee County and treat her so poorly makes me question any further trips to Sanibel. The Shell Bug is obviously hers, and you need to do the right thing and give (or sell) it back to her. Dear Commissioners: Pam Rambo loves, lives, and breathes Sanibel Island and her glorious beaches located in Lee County, Florida. 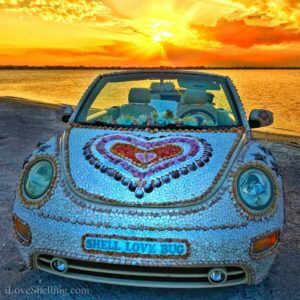 Pam trusted you and created the “Love Bug” with many helping hands and hearts – not to promote herself – but to let light shine on Sanibel Island and surrounding areas, thereby bringing welcome attention to Lee County and the beautiful state of Florida. Pam’s unique design of this treasured VW speaks volumes in a world such as ours, and you will never find a finer, more enthusiastic, ambassador of good-will than Pam Rambo. I respectfully ask that you step back and re-evaluate your motives and decisions. Please do not continue turning the “Love Bug” into a weapon of discord. Her destiny should be one of spreading love, interest, and education under the wings of Pam and Clark Rambo on Sanibel Island, as was intended. Their many, many friends across the country, Canada, and far beyond will thank you, the Commissioners of Lee County, and reward you with continued tourism and income. Thanking you in advance. Pam has done a tremendous job of educating the community not just locally but world wide about shells and shelling. Through her education, shellers know which shells can be collected and which shells are protected. As an individual Pam Rambo has done more to protect the beaches of Sanibel as well as introduce the area to many who would have never visited . It is the information provided by Pam through her website that has drawn thousands of people to Sanibel, Florida. People identify The Shell Bug with Sanibel and Pam Rambo- Not Lee County officials. People visiting Sanibel seek her out, and seek out The Shell Bug. Pam and The Shell Bug are one- and should be brought back together.!!!! We visit Sanibel every spring..it was fun To spot Pam driving the Love Bug. I believe Lee County probably has more urgent matters to deal with rather than spend time in a lawsuit with Pam. Pam and the love bug are one unit and represent Sanibel to all who visit Sanibel…what better trademark can there be for this great island. Pam is an incredible ambassador for Sanibel Island and the shelling community. What do you stand to lose by honoring your verbal commitment to her? Your actions are harming the public image of your awesome community! A reversal of decision would truly be appreciated and celebrated!!! Thank you! I have been following Pam’s blog since it began. She has put Sanibel Island on the map!!! That car needs to be with her. Look at all of the tourism she has brought to your area. This is disgraceful of Lee County to go back on it’s promise.!!! The only way I learned about beautiful Sanibel is from Pam’s iloveshelling blog! After following.. I just had to get there. For the past five years I have visite two to three weeks in January and occasional make it back twice! I have spent thousands and thousands of dollars enjoying Sanibel .. through my enthusiasm, I have had at least ten other folks to come to Sanibel, now they are return tourists as well. Sanibel feels like home the second we cross the bridge. Pam is so delightful and beautiful …. you couldn’t get a better ambassador for you county. Do the right thing: Return the love bug to Pam… it WAS promised to her!! Who needs a written agreement?! She trusted … you betrayed her. Please do the right thing Kee County…. if you don’t , you’re going to be sorry because this will dismay so many from ever visiting again. Shame on you Lee County! Pam is an environmental eduacator and artist! Please take this into consideration. She has drawn in countless $$$ tourism through her posts, for Sanibel and places beyond! Why you would want to take what belongs to her and treat her so badly? We all stand by you, Pam, hoping and praying that you will win this fight. Not for a financial gain but because it is rightfully yours. An oral agreement is a contract! Stick to the agreement! While I am not a resident of Lee County I do come to Sanibel every year and bring several gal’s with me and spend 7-10 days on the Island. What brought our group The Carolina Girls to Sanibel was you guessed it Pam Rambo. We were part of Pam’s first shellapalooza ( not sure if that is how she spells it) but the point is LEE COUNTY we came because of Pam Rambo . My husband was dying of Cancer at 52 years old and Pam and her super sheller husband Clark made me not only forget for a few days what I was facing but there tireless efforts to show us your beautiful island is what has brought our group back every year. You know LEE COUNTY you have a real gem in Pam Rambo. No advertising budget could bring your county what she does. Since my husbands death I live my life doing an act of kindness every day. Today LEE COUNTY you are the recipient of that kindness. That act is not to judge you but to take this time to help bring awareness to what you have done. Most people caught in a lie do what your county attorney did to bring to light how the title, registration etc is registered to the county. That doesn’t justify the fact that Pam Rambo was lied to. So know even people in your position make mistakes however you can do the RIGHT THING and correct the mistake you have made and live up to your word. Return the Shell Love Bug to Pam Rambo as promised!!!! Our group was about to start planning our next trip to Sanibel bringing a few new sheller’s with us but we are going to put a hold on those plans until we see the outcome. You can have a beautiful Island but if you loose the tourists $$ where will Lee County be. We all know the answer to that! Step up LEE COUNTY and do the right thing HONOR YOUR AGREEMENT ! We are watching from North Carolina. I think that the artist work Pam and all of her volunteers, along with the donations of their beautiful shell collections, which I am assuming they were not paid for, either time or materials, has brought many times the value of this old car in tourism dollars to your County. Hiding the car now is doing nothing to promote shell collecting on your beaches, a hobby that has became a big money maker for areas with great shelling hunting. This is bad press, and likely to do more harm than good for such a small dollar amount. Let the group pay for the actual car if the less than $8,000 is such a big deal to the county budget, even though they have reaped publicity and tourist dollars many times over that value through the publicity of the wonderful work of art, shell art, and creativity. Aww, C’mon Lee county! You’re just shooting yourself in your PR plan. Behaving like Scrooge is not in keeping with the Sanibel vibe. Drop the argument and be proud of what your citizens have made! Why are the local county bureaucrats always the worst to deal with, the Shell Love Bug is Pam’s beautiful representation of Sanibel/Captiva. She is the artist, this is a part of her not a part of Lee County. Please return the Shell Love Bug to Pam Rambo and Sanibel Island. It’s heartbreaking to think that all the love and hard work that went into it by the dedicated shellers will be disregarded and for the Shell Love Bug to be taken away and not used as originally intended. Please do the right thing!!! Lee County you have more important things to worry about! This beautiful piece of artwork needs to stay where it was created! You are making fools out of yourselves with this petty nonsense! People who will see this will not come to our beautiful Sanibel, and you will turn people away! The only ones benefiting from this are the lawyers! Enough, drop it already and move on with more important issues this county needs to address!!! Please return the Shell Love Bug to Pam Rambo and Sanibel Island. The Shell Love Bug was created by Pam and her fellow shellers. Without their creativity and hard work it would only be a car. Pam Rambo is a wonderful ambassador for Sanibel and Lee County. Please work with her as she is such a positive force for tourism in your county. We only knew of Sanibel because of her, and I know for many others that is also the case. Bring back Shell Love Bug! Let’s have JUSTICE here, and return the famous Shell Love Bug to it’s rightful owners, the people of Lee County, all visitors to beautiful Sanibel/Captiva Islands vicinity, and its creator, Ms Rambo. You have no business taking something that is not rightfully yours!! Where is the common sense here, per your recent “actions”???? Get on with the business (of the people) you were elected to do for Lee County, and leave the enjoyment and fun up to the rest of us who really enjoy having this “art work” on the Island where it belongs! I’ve been coming to bonita springs,naples and fort myers for the last eight years.I buy my beach pass so I can go to Sanibel,captiva,bonita springs and do my shelling that I love.what your messing with is one of the most loving caring people I ever met.she promotes Sanibel better than anyone person in the united states and I will not renew my pass ever if you keep this political baloney going its not fair to anyone other than the people doing this out of jealousy,i have 20 more people from ohio that feel the same way and they also wont support Sanibel about anything period. Dear Lee County, My family and I have spent thousands and thousands of dollars every year for the past 10 years vacationing in Ft. Myers and Sanibel and it is all due to Pam Rambo. She has singlehandedly done more for Lee County tourism than any other marketing campaign. Shell Love Bug was a true labor of love and no one else could have done it better. After all the countless hours and personal treasures that went into making Shell Love Bug, Pam deserves to have the car returned to her as the rightful owner (as promised). Please do the right and honorable thing and transfer the car to Pam. The world is watching and praying that you will make the right decision. We have been to Sanibel 2 times in the last few years because of Pam’s I Love Shelling blog. After reading it faithfully for a couple of years I HAD to go there. I had grown to love it even before I ever set foot on the island. My vacations there did not disappoint me and i plan to go back. I ask that you fulfill your promise to Pam for all she has done to bring people to the very island she adores. It’s the only right thing to do. Return the love bug to the one who loves your area the most…really…., why be this way!? Lee county. You hadPam and severl Sanibel shell collectors create this awesome piece of art. The artistic value alone outweighs the value of the car. If she took all her shells off as well as the others donated my shellers of Sanibel, the car would be useless. Give the Love Bug back to those who created it. This shell Love Bug Car belongs to Pam. She and volunteers are the ones who did the hours of labor looking for shells and putting the car together. It was her labor of love not Lee County’s. Do the right thing and give Love Bug back to Pam so we can enjoy it when we come and spend our money on Sanibel in Lee County or I may start going to another special place I love for shells and be closer to family I can visit as a bonus! My sister and brother in law helped with the shell love bug….it belongs to Pam on Sanibel. Where is your honor Lee County? As a fellow artist, I was incredibly saddened to hear about what happened to you. This is clearly a true labor of love, and that they won’t even let you purchase it after YOU and the community of Sanibel have added so much value to it is horrible. My husband and I go to our local beaches up north, where I would look for rocks, and he would look for shells. (Shells are pretty thin on the ground up here!) As a thank you for years of patience with me and my pebbles, I surprised him by planning a trip to Sanibel — an idea I got only after finding and reading your blog, because I knew it would be the best surprise for him ever. That was years ago now, and now we come every single year for a week (missing only one year along the way due to a family illness). This year we already have our trip booked for two weeks and hope to do the same in the future because one week just isn’t enough! And this is entirely due to you, your creativity, how much you share of your findings and creativity and travels, and your blog. You personally are so much more a treasure to Lee County than the shellbug — glorious as it is! — could ever be, and it’s about time they realize that and treat you like it. Greed! This is the ONLY reason the county would be holding out on Pam. Do the right thing and give the Bug to her rightful owner, Pam Rambo. Pam and her crew of volunteers created a beautiful piece of art, it’s a shame that the agreement is not being honored. (Even if it was a verbal agreement) the hours put forth to create the Shell Love Bug Should go back to Pam and the Sanibel Community. I think the compensation for her work on The Shell Love Bug should be returned to her. If Pam would have entered into a monetary agreement would they be backing out now. They should return it. Pam, You have brought so much joy (and tourism) to the area!! My family absolutely loves reading your blog articles and seeing all the pictures of your shell treasures! It helps us feel like we’re right back in Sanibel, one of our favorite places in the world. We saw you and the Shell Love Bug this summer at the Lighthouse and I thought I was going to hyperventilate seeing you and the car!! Lol My kids loved actually seeing the car with all the beautiful shells!! What an absolute work of art!! Thank you for your kind, sweet, passionate spirit!! Please don’t let this get you too down. Focus on all the joy you’ve brought to so many!! I am an outer banks of NC home owner and have been to Sanibel twice in recent years and just loved the shelling and the gentle waves. The OBX just does not have the shelling that Sanibel is home to and the gentle, warm gulf water. Pam’s web site, I Love Shelling, keeps me happy seeing all the fun times people have shelling and learning about nature. Sanibel Island is an exceptional place and the Shell Love Bug belongs there. Any other place would not be a fitting “home” for such a shelltastic example of art. Please seek an equitable solution to this unfortunate problem. I first came to Sanibel Island last year as a direct result of Pam Rambo’s posts on YouTube and I love shelling. I was able to meet her and share her enthusiasm and knowledge on one of her cruises. I retuned again this year and intend to in future years. Please support her hard work! My family first visited Sanibel and Captiva in 1963, about three months after the completion of the Causeway. We are currently the second, third and fourth generations enjoying the islands and the county. Pam Rambo is the most eloquent and prolific ambassador for the islands and the county that we have encountered over the last fifty-five years. Why in goodness name would you go to such lengths to antagonize the best representative that you have? This is sheer stupidity! What my grandmother would have called “cutting off your nose to spite your face”. Send the Love Bug back to Sanibel and back to Pam. Remember, the beautiful birds of Ding Darling are the Roseate Spoonbills. Quit acting like stupid ostriches, with your heads in the sand! Sanibel island is such a beautiful place and everyone we’ve met while visiting has been wonderful. This is why I’m so confused hearing about the ugliness surrounding The Shell Love Bug. What happened? I followed Pam’s blog as she shared photos and told her story of all the details involved in such an undertaking in creating The Shell Love Bug. Pam and her volunteers designed the entire Shell Love Bug, planning all the details, using shells from her personal collection. Pam gave life to The Shell Love Bug. In the photos she shared, you could see the love her in her eyes and you couldn’t help but feel her pride as she so proudly threw her arms in the air in a grand fashion as she presented her baby to the world! When I think of the countless hours and dedicated work that both Pam and the other volunteers worked tirelessly on in this labor of love, my heart breaks. When Pam ran out shells, she asked her readers to help by donating shells from their personal collections. Pam even offered to replaced the shells. Lee County….please return baby back to its mother. She’s heartbroken. Pam is an excellent ambassor for Sanibel. Lee County Commissioners-I just happened to find Pam Rambo’s “ILOVESHELLING” website one day as I was surfing the web and I have never been the same. I no longer vacation anywhere but Lee County FL. I come as often as I can but I always come at least twice a year. I always spend at least 2 nights in hotels in the Ft Meyers area-the first day of my vacation and the last day of my vacation and sometimes longer. I spend my dollars lodging, eating out, shopping, and on entertainment. The rest of the week is spent on Sanibel Island. I come to YOUR COUNTY because of PAM RAMBO. She is the one who attracted me to your beautiful county. I had seen advertisements in magazines like Southern Living for Sanibel Island but just turned the page and went on but Pam Rambo’s blogging website brought the island to life for me with pictures and videos. I am convinced that she has attracted thousand if not more to Lee County. You should have her on your payroll for all that she does for your community. She is such a sweet and loveable, friendly lady and worth her weight in gold for your county. Please show her your appreciation for all she has done to promote the county and let “Shell Love Bug” come back to Sanibel Island under her care. It can only be a good thing for your county and for your tourism. Since “Shell Love Bug” was born I have tried to see it but never have. I have called Lee County and asked if they have a place where they display the car and they have said no. So unless there is a special event going on when I come to town that involves “Shell Love Bug” I can’t see it. I really don’t think that is utilizing the car very well. I believe if Pam had the car she would display it so it had more exposure. Actually I would love to see it at the Shell Museum on Sanibel Island. 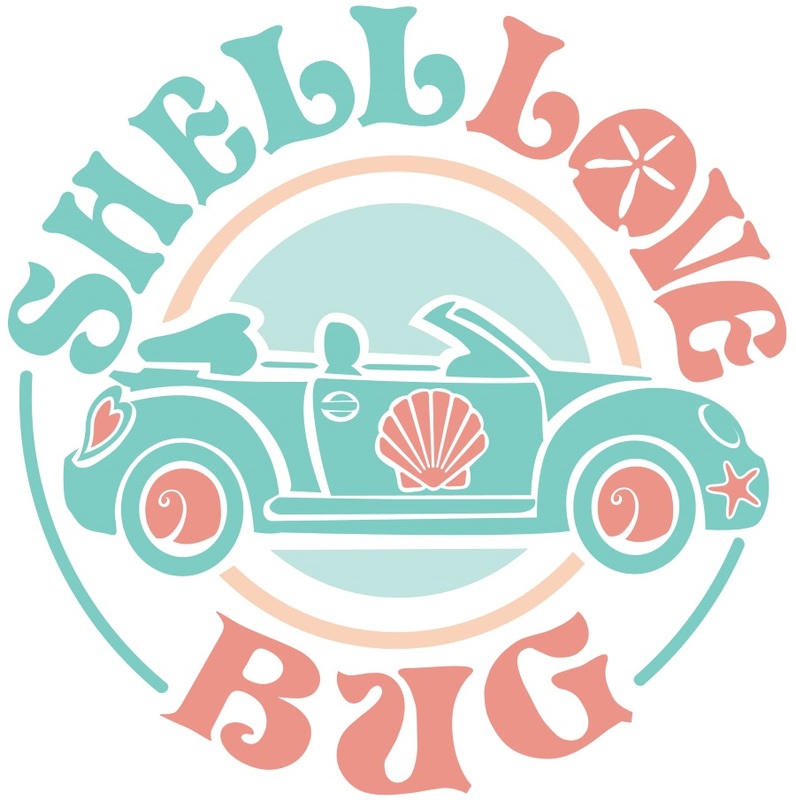 What a wonderful idea….find a special spot at the Shell Museum for The Shell Love Bug! Both the museum and Pam to have shared responsibility of The Shell Love Bug with Pam having Legal Guardianship. Lee County could still hold the title to the Shell Love Bug. Visitors on Sanibel could visit The Shell Love Bug at the Shell Museum! This alone would create more tourism, especially to the Shell Museum. Visitors would not be disappointed in their hopes to see The Shell Love Bug….something I so want to see, just like Susan Riley, (whose post I’m replying to) and sadly have not had the pleasure. Pam Rambo should be awarded shared responsibility for The Shell Love Bug and able to schedule outings, driving The Shell Love Bug around the island. Imagine the thrill of looking up and spotting Pam Rambo driving The Shell Love Bug around the island! The excitement would grow and inspire additional interest in shells! The happiness that sight would inspire….bringing a community together, so opposite of what is happening right now. Pam Rambo should have all rights and responsibility as Legal Guardian to schedule The Shell Love Bug’s appearances and freedom to take “her” off the Shell Museum property when she sees fit. The Shell Museum would be her caretakers while on their property. Lee County could “own” The Shell Love Bug….in name only and able to share in decision making concerning The Love Bug. But the ultimate and final decision should fall to Pam Rambo…why…because Pam loves this car, it’s her vision, her creation, her dedication that brought the World’s Largest Sailors Valentine to life….she gave birth to the conception of The Shell Love Bug! Pam Rambo is Sanibel Island’s biggest promoter of the island…her love of Sanibel and Captiva is Lee County’s best ever ambassador. Please find a simple solution to allow the Shell Love Bug to be in Pam’s permanent possession. It is the right thing to do. I know of no other person who has unselfishly done so much to educate people on so many aspects of beach life. This is so silly of Lee County! This is a unique part of Sanibel and Captiva and inspired by the artwork of this lady. Its such good publicity that I can not imagine the county trying to keep a very special piece of artwork. If they must keep it for retail value then she should be able to take all her shells off and give them a worthless and shellless car! Promote rather than demote!! They should be rewarding interesting ways to attract people to this area instead of this childish sniping at one of their own! They better give that bug back. Utterly ridiculous. Sorry for this reply, but in following Pam’s request to keep this venture civil, we need to reframe from inappropriate language. Thank you Sandra!!!!! I’ve edited Chrystal’s comment to be family appropriate. I understand she was just mad and wanted to speak her mind- it’s hard to find the words to show how upsetting this is. I thank her and thank you. You are awesome to help keep this family safe. Thank you Chrystal for your support. Just so you are aware, I’ve edited your comment to be family appropriate. I so appreciate that you are you are helping me bring Shell Love Bug back! All you need is a news channel on this story and the shell bug will be where it belongs, back in Sanibel. In 2014 while caring for my husband who had cancer, I found the Iloveshelling website and therefore, the personality of Pam Rambo, an enthusiastic supporter of shelling as a hobby and Sanibel. I thought this would be a great place to visit once/if my husband recuperated. God blessed us greatly with remission. Consequently, we have driven 3 days each way with our dog both in 2016 and 2017 to visit Sanibel, first for one week, and last year for 3 weeks on the island. Each time, we took a shelling cruise with Pam. And also, met her and her husband one evening on the beach, where they were friendly and gracious. In addition, last May during our visit, we found a coveted junonia shell, and were interviewed and had our photo in the Island Sun newspaper. This was truly a highlight of what has been a very difficult few years with health and loss of loved ones. Additionally, we eagerly watched Pam on Good Morning, America when she promoted Sanibel and used the Shell love bug as a PR tool for Lee County. So, Lee County Commissioners, are you crazy? This is a travesty against not only Pam Rambo, but also against the lovely people of Sanibel who contributed to the project to promote their island and its many assets. We also spent many thousands of dollars traveling to Florida, and specifically to Sanibel, its restaurants, shops, tours, etc. It’s just a matter of time, if it hasn’t happened already, that the national media gets hold of this story, and the negative publicity will be extremely detrimental to your area. I think you all should reconsider the wisdom of extending this very short sighted and insensitive notion, and give Pam the Shell love bug. Makes all of you look petty and untrustworthy. Please, do it now. Thank you for your consideration. Pam is just not a blogger, she’s an outstanding person who has brought national attention to the Sanibel and Lee County area. Creating the Shell Love bug was a lot of work but it was with great love that she helped create one of the best PR for the county. During this period in our life, words should matter. I wish the City of Sanibel would also help with this problem. Pam’s wonderful videos of Sanibel Island are how my husband and I learned about the island years ago. We would never have known about how beautiful it is if we hadn’t seen her videos on youtube. We have made several trips to Sanibel over the past few years, are going back next month. The people who live there are wonderful, welcoming people and the island still gives a home town feel as well as a beautiful seaside escape. Pam is your best ambassador for this area of Florida and should be supported. I just looked up the price of a 2005 beetle convertible … $6000. We come to Sanibel for two to three weeks in Winter and my brother comes for another two to three weeks. We eat out, shop, buy, rent two condos, etc., etc. Bet it didn’t take us long to spend close to that in Lee County! But aside from that, I totally agree with every thing all the others have said. We have been on several shelling cruises with Pam and my sister and I came for one of the Shelling get together at The Island Inn. We had a wonderful time…as we have had with all our trips with Pam. My Sis has been a fan of Pam’s for many years and got my husband and I hooked on Shelling … and Pam…and Sanibel…when we started coming down with her. Pam and Clark are great people! Do the right thing and return the car to Pam! The Shell Love Bug is a creation of the artist, Pam Rambo. The value of the vehicle is and forever will be directly related to the art work on it. Pam owns the copyright on the art work. Therefor the car should belong to her and she should have the right to use it to promote the Island as she decides. The priceless shells she included on it would not been attached to it had she known that this car would not be in her ownership in the future. Please do whats ethically correct and return to car to Pam Rambo. I’m sitting here on Sanibel Island it is my third time here. This trip has been very depressing first to see all of the dead crabs, fish, and egg cases very disturbing so I thought hey lets go find Pam. I looked at the website and started to cry that is horrible! The 1st time we came to Sanibel Island 9/16/16 sitting on the side of the road my girlfriend punched me saying Shell punchbuggy no punch backs i said what shell punch buggy i jumped in the suv drove on the sidewalk around traffic to catch Pam i was thrilled to get to meet her in person & see that pretty shell punch buggy that is her work of art her love of shells that she openly shared with people. Strangers she had never met before knew her when they saw that car. I hope the next time i come to Sanibel i can find Pam in her shell bug. Its only right for them to be reunited. Lee County do what is right. Lee county, please do the right thing and return the Shell Love Bug to Pam Rambo! This VW bug was an inexpensive, used car before Pam turned it in to an exquisite, moving work of art! Without Pam’s design, her shells, her hard work, and the shells and hard work of many volunteers, this car would have little value. Pam deserves to have the car because it is her creation! I was deeply saddened that the Shell Love Bug was not at this year’s Sanibel shell festival, and I hope to see the car return to Pam and to Sanibel island where it can be displayed for everyone’s enjoyment! I have visited Sanibel regularly for many years thanks to Pam. Before I started following I Love Shelling, I randomly visited beaches around the state, but after following Pam, my interest in shelling grew, and I decided to spend the majority of my vacations on Sanibel. Pam has brought a lot of revenue to Lee County, and she deserves to be treated fairly. 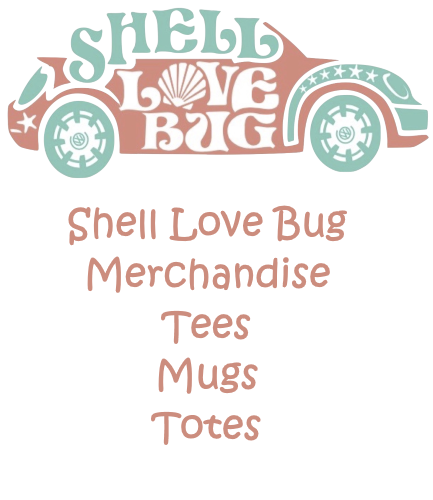 Return the car to Pam, to Sanibel, and to the people who love the Shell Love Bug! I am counting on you, Lee County, to do the right thing! One of the reasons we visited Sanibel last year! We come to Sanibel at least once per year. We were introduced to everything Sanibel BY Pam and HER She’ll Love Bug. It is unthinkable that her art, design, time, and incredible promoting of the area, could be taken advantage of and outright stolen. As an Artist I am furious. As a regular visitor (who is talking future property there) I am insulted. Support the best promoter that your beautiful island has ever known. I believe Pam Rambo is the ultimate in an ambassador for Lee County. This Shell Love Bug was a labor of love. Pam is an artist and as such deserves to be honored for her many contributions to promoting not only Sanibel but all of Lee County. She has spent countless hours sharing her love of shelling with any and all persons. Her blog is an educational resource for anyone interested in shelling, visiting Sanibel and Lee County. PLEASE honor your verbal agreement with Pam…do the honorable thing. I have met and spent time with Pam and can tell you she is a consummate artist and outstanding human being who poured her talent and heart into this project and I know she worked and still works tirelessly to promote the love of not only shelling but her love of island life and SWFL as well. In a world full of such violence and darkness, it’s unthinkable to penalize someone ,such as Pam Rambo for trying to bring beauty and peace through her art to Lee county and Sanibel and the entire state of Florida. What happened to “your word is your bond”? If you would go back on your word on this issue….how many others have you done the same to? Your actions have demonstrated the true nature of your board members. It is a low,shoddy, underhanded way to treat Mrs. Rambo and the others who gave their time and efforts to create a piece of art . They placed their trust in your word, which was supposed to be your bond. Shame on you all….SHAME ON YOU! Do the right thing and return the Shell love Bug . You know you should. This makes me sick! Lee County- return the Shell Love Bug to its rightful owner. Pam has been an amazing promoter for shelling/tourism in Lee Co. (She reached me all the way in WI- you, Lee County, have not. You give your county a bad name with a matter such as this- give the car back! I have an additional comment/observation. Perhaps, in addition to giving Pam legal ownership of the Shell Love Bug, Lee County and/Or the City of Sanibel should reimburse her for personal expenses the past two years and now compensate her by creating an “official” position to represent the area. Maybe that’s why you’re holding on to the Bug? Afraid your free ride is over? Give this generously spirited woman the benefits she deserves for so admirably representing Sanibel. I certainly hope that you do what is honorable and right and return what this wonderful woman did. If not she should receive all the shells returned!!! Give the car to Its rightful owner ….Pam Rambo! Shame on the Lee County Commissioners. How much of my tax dollars have you spent on this wrongdoing? Going back on your word, is this common practice? What else are you trying to put over on the Sanibel residents? I lived on Sanibel for over 30 years and Pam is one of the islands biggest asset. Do the right thing and live up to your word, give Pam the car as you said you would. Please return the Shell Love Bug to Pam Rambo. It is truly the right thing to do. Pam has been a remarkable enthusiastic supporter and promoter of the region and of shells and shelling. Her knowledge and passion for it all is contagious and has drawn innumerable people to Sanibel and surrounding areas for years. The Shell Love Bug should rightfully be in her care. Because of Pam Rambo and ILoveShelling, my interest in Shelling grew into an obsession! For seven years I have traveled to Sanibel and Lee County beaches. Sometimes multiple times a year. One awful winter I returned FIVE times! Other friends have become turned on to Sanibel for their vacations because of me, BECAUSE of Pam Rambo. We’ve spent multiples of the cost of the original white used bug. Beaucoup Buck. My point is, you are costing quite a bit of good will by withholding The Shell Love Bug. The longer this remains unresolved, the worse it is going to get. Either way, its an observable fact. It will get worse for you, Lee County Commissioners. Find a solution, possibly a compromise. Honor the gifts you’vereceived from Pam Rambo. Make nice, make her happy, make everyone else happy. Another visitor who came to Sanibel because of Pam’s blog. Remember that for every comment sent there are probably 10 more people who haven’t signed/sent a comment. Do the math. That adds up to a lot of visitors and a lot dollars for your area. Surely Pam has paid for Shell LoveBug multiple times over in the amount of tourism money she has brought to your area. If you would take the time to read Pam Rambo’s blogs it might help you to understand what a kind, generous and trusting person she is. I am sure that your office must have put a lot of faith and trust in her to give her a car for quite a long time so that she could decorate it. Why didn’t you put out an APB on Pam for “stealing” your car after you handed her the keys? Because you had an agreement with her, even though it wasn’t in writing, and now you need to honor the terms of that agreement. You say that no one had the right to make an agreement with her, but you handed her the keys and then never called the police on her, didn’t you? Someone in Lee County made a deal with her whether they were supposed to or not! Why did you give her the car in the first place? You knew who had your car and what she was doing to it and what she expected out of the deal. You should be ashamed of your county for treating one of it’s most valuable residents with such little regard! Charlotte Harris you hit the nail in the head!! for what she and the sheller community have created !! I Love Shelling too !!! Dear Lee County, you very much need to consider the amount of touism dollars Pam has brought to you. I came to Sanibel because of Pam, showed other people her website and instagram which brought another 6-10 people in Sanibel, and so on and so on. Honor your artists and craftsmen. Honor your citizens. And if you don’t want to do that, consider it payment for all the free marketing she has given you. There are givers and takers in this world – Pam Rambo has given a gift to her community of her love and passion of shelling and has shared this passion with her shelling community who have in turn enriched Sanibel. Her community should give back to the Rambos the piece of their hearts and souls they have taken. They will continue to share this passion because that is who they are. Sanibel is a unique place for shellers and Pam is a unique ambassador for Sanibel. I spent a week in Sanibel/Captiva and many tourist dollars because I read Pam’s blog about the shelling there. Also went on the day cruise w her! I hope they realize how she encourages tourism through her efforts and respond accordingly! This is art that belongs to the artist! My wife and I have been coming to Lee County to vacation for years and it is all because of Pam Rambo. She is the best ambassador for Ft. Myers and Sanibel and I’m sure you know that. She would never have gone back on her word like you have. Shame on you! This really puts a bad light on the politicians of Lee County and I suspect it will be reflected in the votes in the next election. Stop being greedy, do the right thing and turn over Shell Love Bug to Pam so It can go home to Sanibel where it belongs. Lee County Commissioners: OPEN YOUR EYES! unique about our islands. Pam created it based on the promise that it would be hers. Honor that promise and return the SHELL LOVE BUG to her! I have family in Lee County and Sanibel is my second home. This reversal of a verbal agreement and tanking or original artwork from an artist doesn’t sound like something that should happen on our Island. Give P her Shell Bug back, please! Pam Rambo is a Sanibel, Captiva and Lee County treasure!!!!!!! Florida is lucky to have her!!!!!! Send the Shell Love Bug home! Because of Pam I began a love affair with seashells that brought me to visit Sanibel, and Lee County is where I plan to retire! Please do right by all Lee County residents and those who love Sanibel and all it has to offer! The car is a work of art..please do the right thing and give the car to the artist that created it. Lee County, you are lucky she’s a resident. She has done more for tourism in your area than your shells. From print to television, her mass appeal has changed the shelling community from an “old folks hobby” to one all ages enjoy. Not hating on old folks, but, shelling had a bad rap before. This is about artwork, ownership and integrity. Which Ms. Rambo has in spades. I have spent three weeks on Sanibel for each of the past 13 years. I have spent tons of money on meals, accommodations and gifts. You have seen the last of my money unless the Shell Bug is returned or your pay the artists that worked on it their hourly rate and pay for each shell. This is theft! Although I do not know Pam personally, I have been a fan of hers for a few years. It is really beyond my comprehension how the people in charge can or could expect Pam and her fellow workers to create such a beautiful testament as the Love Bug for NOTHING! The designs, the shells, the time, the expense the love that was involved in creating this work of art boggles ones mind. If the county commissioners have a shred of decency in them, they would give the Love Bug back to PAM! I believe when someone pours their heart and soul and their love of the island and shelling into a huge project like this, then at some point it should be given back to them. I have been coming to Sanibel for 15 years and I dearly love the island and it’s residents/businesses. I make a point to leave the place I stay as clean as I found it and respect the shelling laws and the island laws. I support the local businesses and try to spread my spending over as much of them as I can. Please return the Shell Bug to Pam. She deserves it. I am writing in favor of bringing the Shell Love Bug home to Sanibel. Pam Rambo’s artistry is amazing and she should have the Love Bug back. She acted in good faith based on representations made to her by a county representative, whether that representative acted with authority of the county or not. Pam acted in reliance on the statements, putting in thousands of hours in creating the designs, supervising and participating in execution of her designs. The county should be estopped from going back on the representations made that Pam relied on in going forward with the project and creating this art work in good faith reliance. Shame on u Lee County. Pam Rambo and her iloveshelling blog has brought people and their monies from all over the world to ur county. She is personally responsible for introducing many many people to ur county. Do ur commissioners attract that kind of money. I bet not. As an artist I am so disgusted by this. It is insulting to imply this woman gave her time, talent, and personal collection for recognition? Have you lost your mind? In what reality is this even acceptable? Pam has worked very hard on Shell Love Bug, who is made almost entirely of billions of shells. With her own seashells, and the contributions of other faithful shellers, she has created a beautiful piece of art that she enjoys sharing with the world. She has brought much joy to a lot of people and deserves to keep her car. Please Lee County, let Shell Love Bug go back to its rightful owner. This is not right .Pam deserves to have the Shell Love Bug back .It is a precious piece of art one of a kind created by Pam who is the rightful owner. Let’s see some honesty in the Lee County Commissioners . Lee County Commission: please honor the agreement made with Pam Rambo and the volunteers that made Shell Love Bug what it is today. Pam brings people to your area by the “boatload” to enjoy the shell riches of Sanibel Island and surrounding areas. She’s a treasure and Shell Love Bug belongs with her, as she was promised. We are avid Sanibel lovers and vacationers for over 5 years…and all because of Pam Rambo. Pam has donated countless hours of her time and her knowledge and expertise bringing awareness of Sanibel and it’s treasures to the world and in doing so has brought Lee County thousands of new Sanibel visitors spending their money of which Lee County benefits. Pam did not create the Shell Love Bug for recognition…really? She is an artist and used her talents and thousands of hours of her time to create something wonderful for Sanibel and acted on good faith based on what she was told by a Lee County representative. The Shell Love Bug belongs in Sanibel…with Pam…for all of Sanibel to keep enjoying for years to come…period!!!! I pride myself on being a “rare find these days” in relation to being a LOCAL SWFL second generation born & raised… You know why? Because we saw the true, natrual beauty of a wild lil island. Freedom in Paradise. “A rare find” just like finding that one special shell on the beach that NATURE created. Not man. Pam has not only created a Priceless piece of ART & should be rightly compensated, but she has also reminded us of what we often forget in our everyday hustle. Which is to relax, stop, look around & enjoy the small beauties of what Nature has provided to us. Bring it back to the basics in life. The way of life/love/shells & sunshine Obviously being proven favorable & highly desired by attracting so many to SWFL via her online Blogs, Social Media, Etc. She has Boosted tourism, education & conservation. Unfortunately $$$ & human greed is always the bottom line. Or…Is it? Now don’t forget County Comissoners, Mother NATURE & KARMA always seem to come back around & prevail when u r least expecting it… Hurricane Pam, Season 2018 Cat 6! Lol. Don’t get these shellers fired up now… We come in PEACE. Much love & respect to everything Pam has done for our natrual, lil wild island town. Do the RIGHT thing Lee County!!! You know that vehicle would no more intrinsic value than any of the other thousands of Volkswagen Beetles on Florida highways were it not for the artistic vision and tireless efforts of Pam Rambo. The car belongs to Pam and the other workers whom all contributed selflessly to its creation, and it belongs on Sanibel-Captiva!!! Please return the car to its rightful owner! A verbal agreement should still be binding! With all the uncertainty in the world today. The hate. The politics. The inequality. The rhetoric. The insensitivity. You, Lee County, have the opportunity to do the RIGHT thing and honor an agreement. As a relatively new resident to southwest Florida, it is the beauty and spirit of it’s residents that have made me fall in love with Sanibel\Captiva. I have raved to family and friends as this IS the place to vacation and spend time in all it’s beauty and wonder. Please don’t make me regret encouraging visitors to choose this area as their vacation destination. Pam has brought so much revenue through visitors to Lee County through her ILoveShelling blog. It’s amazing that, even though verbal, an agreement can’t be kept. Lee County, please do the right thing and return the car to Pam. I have been coming to your lovely area since a child and look forward to the near future of making Lee County my permanent home so when I heard of this shameful situation I was very sad at heart. The Shell Bug doesn’t just belong to you it belongs to all who have a love and respect for shelling. This is your local ambassador to share with the world! You should be gracious and appreciative to Pam and all those who willingly gave their time and treasures. Please don’t allow PRIDE to prevent each other from meeting in the middle and sharing this happy symbol of love and what the ocean gives us, or we will all lose! Trust in Pam she will not let you down and in the end will continue to represent your fine county and state. Remember the children are all our futures and this would be a great learning tool for them to learn appreciation of shells and how to protect God’s gift of the ocean for generations to come. We were all taught as children that sharing was the right thing to do so as adults we should know better and be an example. Do the right thing and all will be happy including you! Pam, your blogs and You-tube videos warmed my heart in Oklahoma for several years. I would come down every year to visit my sister in the Tampa area and go shelling. Last year, we went to Cayo Costa because of info from your website. It saddens me that you are going through this. In Jan, I became a permanent FL resident and love that I can go to Honeymoon Island and Caladesi State Parks to continue a hobby we both love. Thank you for your good heart and love for God’s creation and I will pray that justice will be done for you. We, just as the many others who have commented, found Sanibel because of Pam Rambo. We have now visited multiple times, stayed on the island, spent money in numerous shops, paid the toll fee, and brought others(who also spent money) to the love of shelling on Sanibel because of Pam Rambo….even took one of her cruises. The money she has brought to the county far outweighs the cost of one car! The county should be spending time and money on the issue with the dirty water that surrounds the island now…tourism is going to take a huge hit from it! They seriously need all of the positive promotion they can get…because that water…is….not….good! Pam has been nothing but a tourism spokesperson for the area…it’s time the politicians just make the situation right. Return the Shell Love Bug! So glad to see that the court has agreed to let your claims go forward. (Would have been happier to be sharing another shelling cruise with you, but we will return.) Hope the county now sees its way clear to settle the dispute quickly and you can return to more enjoyable pursuits. See you on the beach soon! Pamela is the one and only reason my family, all three generations, come to visit the island. She got me started, and I will support her in her continued fight to get her beautiful artwork back. I was lucky enough to spot the Love Bug on Sanibel last year…truly an awesome experience! And now the Lee County Convention and Visitors Bureau is soliciting people to join them in a Guinness Book of World Record attempt on National Seashell Day? I’m sure they are holding the event on FMB rather than on Sanibel because they know that if they bring the SLB onto Sanibel, she will be (peacefully) not allowed to leave. Sanibel is home to SLB, and Pam is her Mom. Maybe we should all attend the event over on FMB, and then peacefully help her return to her rightful home and owner! It could be a wonderful caravan across the Causeway, bringing her home! This piece of artwork truly belongs on Sanibel. My family traveled there this June, due to Pam’s iloveshelling website and the cute shell love bug. While she might not possess the title to the vehicle, that’s still her workmanship. Her work wasn’t free. This is illegal. She needs to be compensated properly, and her name needs to be added to the title. This wasn’t anyone else’s project. It’s clear to me that she was lied to. No one would dedicate that much time and effort without expecting proper compensation. The expense of the shells and man hours far outweighs the cost of the vehicle underneath. This is terrible treatment for Pam, and her hard work. This art piece belongs to the people of Sanibel. Return the car to Sanibel!! I’d also contact Guinness and let them know about this. Chances are they’ll refuse to feature it once they discover that the artist was screwed over. info. I’m glad that you shared this useful information with us. The county should realize the value of everything Pam does. The benefits to the county of this beautiful piece if art and her many I Love Shelling posts and blogs far surpass the monetary value of a Volkswagen BEETLE! Do the right thing, Lee County.